Introducing the smart way to increase market share for your hospital’s services. More people than ever are turning to the Internet for actionable information and tools to help guide them through important health decisions and direct them to services to meet their specific needs. That’s why A.D.A.M. is excited to introduce SmartSites – an expanding suite of consumer decision support tools designed to connect new patients to your most profitable services and procedures. Specifically designed to increase market share for your hospital’s services, SmartSites include intelligent assessments which provide users with personalized treatment options and treatment readiness information – all within an intuitive interface to help guide them through the learning process. Convert users to patients by including customized links to physician and appointment information, as well as individual treatments, therapies, and surgical procedures. The sites are also designed to help educate users with detailed articles, cost and quality information, and pre- and post-surgery information. 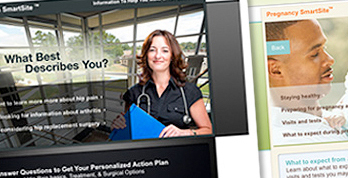 Easily integrated and deployed within your existing website, SmartSites are designed to convert users into patients by leading them to physician appointments and/or additional in-patient and out-patient services – all with the goal of helping you increase market share for this profitable service line.